Yes. You read that right. I ate lunch at school again. But it wasn’t my school. 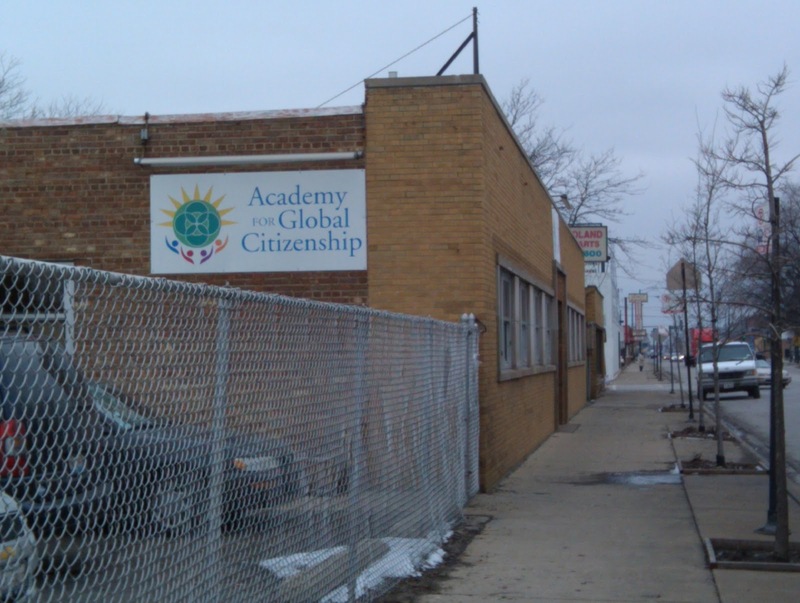 It was a different school – the Academy for Global Citizenship. They serve organic school lunches. And most of my lunch was gluten-free. How do you like them beans? I told you how I met the founder of the Academy for Global Citizenship, Sarah Elizabeth Ippel, in a previous post. She invited me to lunch, but our challenge was finding a day that I was off, but that her school was in session. It turned out we had one choice: March 7th. It’s not hard to locate the school on a map, but it’s easy to miss from the street. Planting a school garden with a chicken coop with three laying chickens! According to Sarah Elizabeth, roughly 80% of her students qualify for free or reduced school lunch. Additionally, nearly 40% of her students are English Language Learners. It’s certainly not what I would expect from a school serving organic food. Milk from Wisconsin, Bread from Chicago, Tomatoes from Michigan. Talking to her, I got the feeling she is going somewhere, but the school is already on the map. 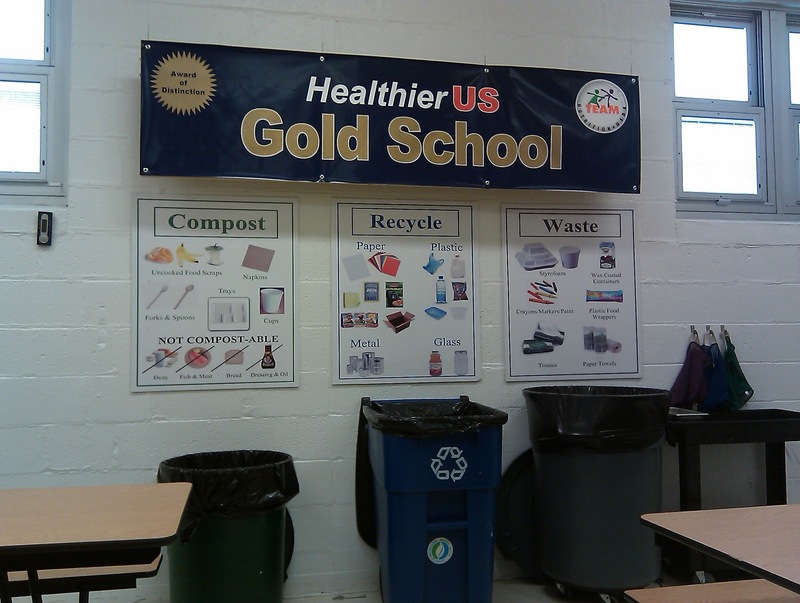 It was one of the first schools to earn the prestigious Gold with Distinction rating under the HealthierUS School Challenge. The Deputy Secretary of Agriculture, Kathleen Merrigan, visited the school to award them with the distinction in person. How cool is that? Sorry it’s blurry – I was shaking with excitement! On the menu was “Brown rice and bean burrito with BBQ tofu steaks.” I declined the whole wheat tortilla, but I gobbled up the tofu, beans and rice with peppers, pico de gallo, kale chips and a sliced orange. 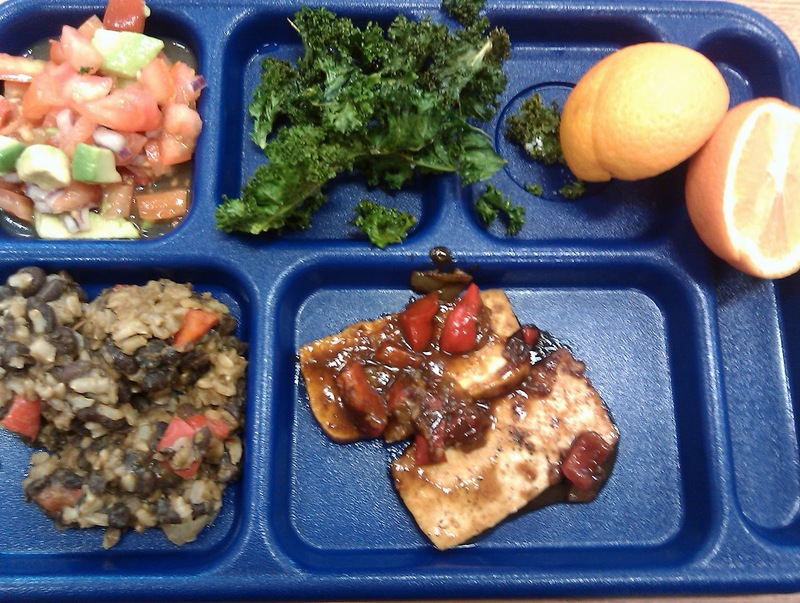 I’ve been eating kale chips at home, but I never thought I’d see them on a school lunch tray. Everything was delicious and prepared onsite! I was even able to meet the chef and chat ingredients! 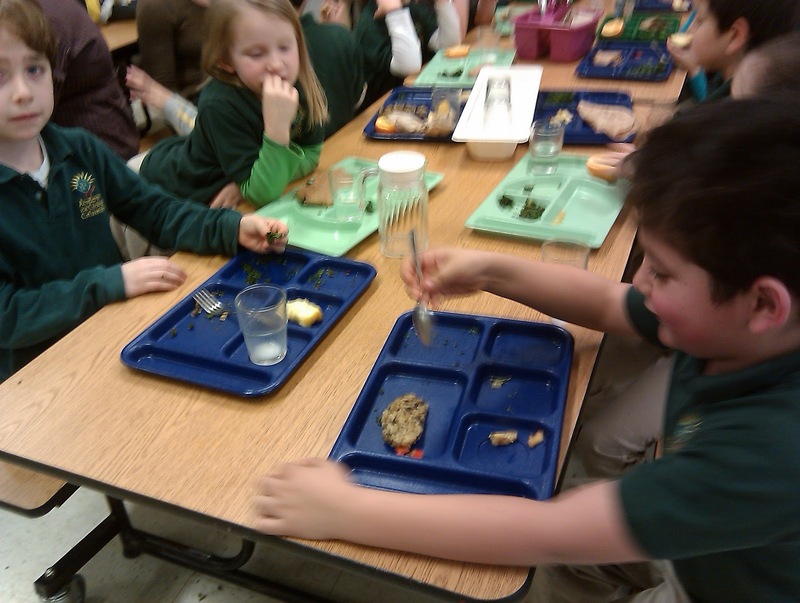 The kids enjoyed the food – see it’s all gone! Sarah Elizabeth told me that initially there was some resistance and wonder about foods like kale chips, but after they saw them repeatedly on their trays and began harvesting these veggies in their schoolyard garden, they got used to new and different foods. It helped that Sarah Elizabeth invited families in for food tastings after school where family members not only got to sample lunch cuisine, but received recipe cards as well. The lack of recess time is what is freaking me out about sending my son to Kindergarten in the fall. They get a total of 40 minutes for lunch AND recess. Meanwhile it routinely takes my son 45/60 minutes to eat his lunch (and his dinner for that matter). I am hoping he will adjust but even so, he is looking at not much recess time for a VERY active little guy. Also — since tofu isn't anything to the USDA, the meatless alternative is the bean and rice burrito. The sky is the limit if everyone takes part in the solution. Wow, the lunch you were given looks amazing. This school needs to come up with a manual for success that can be passed onto other schools looking to provide similar meals, but are not quite sure where to start and how to get there. I am curious to know if there are any students at this school are special needs or are diagnosed with ADHD and what kind of impact if any the school lunches have had on their condition. I think it's great that 98% of the first graders read at grade level. Is that mostly contributed to the food or do they happen to have very dedicated teachers as well? All great stuff that needs to be duplicated at more schools. Welcome back Mrs. Q! I hope you enjoyed your time off. Looking forward to reading the other posts in this series. This is so great. It's amazing what one school can do and really affect that many kids. Thank you for sharing this. that lunch looks awesome! totally something i would eat! Can't wait to hear how they pay for that food…. That lunch looks great! I like that the kids are eating it–goes to show that you can feed kids healthy food. I wonder what the per-meal cost is for those meals? I'd love to know – if they can do it, other schools can too! Your chat with Tim broke my heart. Really it did. It horrifies, saddens, sickens and disgusts me that little tiny kids are wasting away the best years of their lives chained to desks and given 20 minutes to scarf food like they're prisoners who have to get back to their cells. It pisses me off, to be frank. There's no other way to put it. When the hell do kids just get to be kids? What no recess?! Where is the exercise. How do kids let loose?! come check out the XL Pet Pillow giveaway! What a great looking lunch!!!!! I wish it were easier for schools to feed children healthy food. I used to work in an economically depressed area and I was always pleased by how many of those kids ate the veggies offered to them. They were hungry, so they ate. The cost per meal is the most important part of this story and it is not included Mrs. Q. Will it be in part 2? I poked around the school's website a bit. I'll admit…I started crying. 🙂 What a beautiful school. I hope I can find a school like that to teach in after I graduate. Wow! I saw real forks in your pictures! My daughter is always frustrated when I forget to pack a fork or spoon and she has to use a school spork. What an amazing looking meal. It looks like real food, like what I would serve at home. 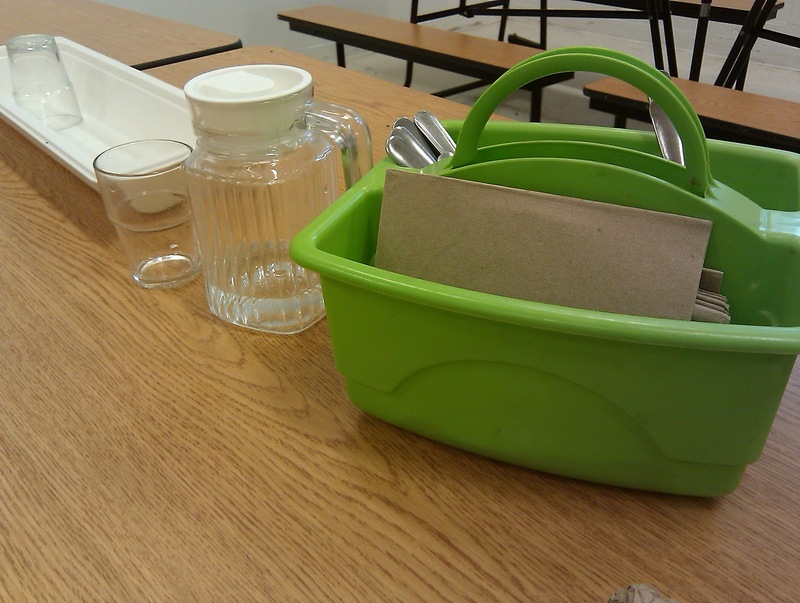 I wish more schools could/would prepare food on site. Thanks for all the great comments! It's really a special place. I loved being there. Hey what gives? 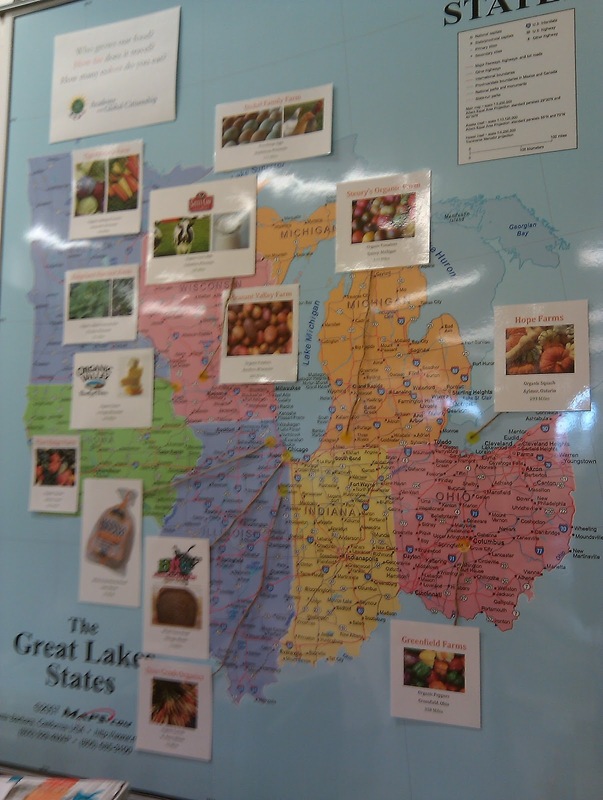 The Great Lakes States wall map includes Minnesota and Iowa(?!) but not Lake Ontario, Pennsylvania or New York. I really like the Compost Recycle and Waste signs. Where can I get those for our school? THanks, would love to replicate!